Traditionally, the detection of microbes such as bacteria and viruses has required their growth in a laboratory, then a lengthy process of identification through straining techniques and, sometimes, tests of their resistance to certain anti-microbial agents. Meanwhile, patients newly admitted to the hospital are not universally isolated from other patients due to the cost, logistics and psychological implications. For resistant microbes, this diagnostic lag time is a boon – it creates a window allowing for their spread to surfaces, hospital personnel and other patients before identification triggers isolation of their host. Fortunately, a parallel track of rapid diagnostic testing has emerged in recent decades. Rapid diagnostic tests bypass culturing and staining, targeting instead traces of the unique DNA or other ‘blueprint’ material inherent in all microbes. While early identification of a harmful micro-organism is of obvious benefit to an individual patient whose physicians can more quickly initiate the right therapy, “the benefit to the general public cannot be underestimated” suggests Dr Angela Huttner of the Geneva University Hospitals. A rapid diagnosis narrows the window period during which resistant organisms can spread. It also allows physicians to avoid the overuse of the ‘big guns’ of broad-spectrum antibiotics, which itself drives the emergence of resistance organisms – so-called ‘superbugs.’ Rapid tests have become a key component in the overall effort to reduce the spread of resistant organisms. They are now used with regularity in some countries to detect methicillin-resistant Staphylococcus aureus (MRSA), vancomycin-resistant Enterococci (VRE), and other bacteria. According to Huttner, the significant clinical impact of rapid diagnostic tests is becoming apparent in the outpatient setting as well. For example, office-based diagnostic test kits that quickly rule out the presence of Streptococcus in patients with sore throats – symptoms that may simply be due to a passing viral infection – allow for a reduction in unnecessary antibiotic consumption. An earlier lack of rapid testing capabilities for sexually transmitted diseases led to the widespread and ‘blind’ use of antibiotics in the attempt to treat all possible infections, which in turn led to the development of antibiotic-resistant gonorrhea. The advent of rapid tests in this domain has also led to a decrease in unwarranted antibiotic consumption. However, “rapid diagnostic tests remain a work in progress” cautions Huttner. “Many have not yet been rigorously tested and validated in clinical specimens. In some cases, they can be too sensitive, identifying contaminating organisms that are not ultimately important clinically. Some platforms are unwieldy and require advanced training to operate.” Turnaround times can be much longer than expected and costs prohibitively high, as specialized staff are required to run the machines. 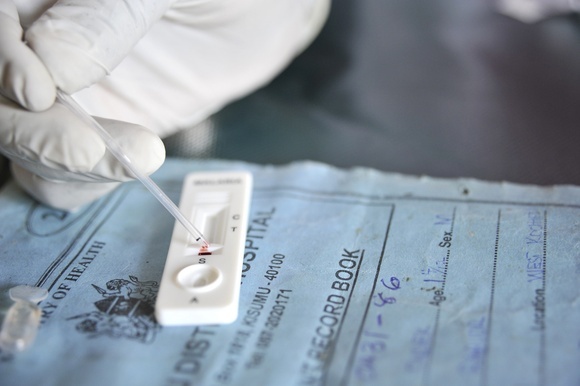 Because of these limitations, rapid diagnostic tests continue to be used in parallel with traditional diagnostic methods.